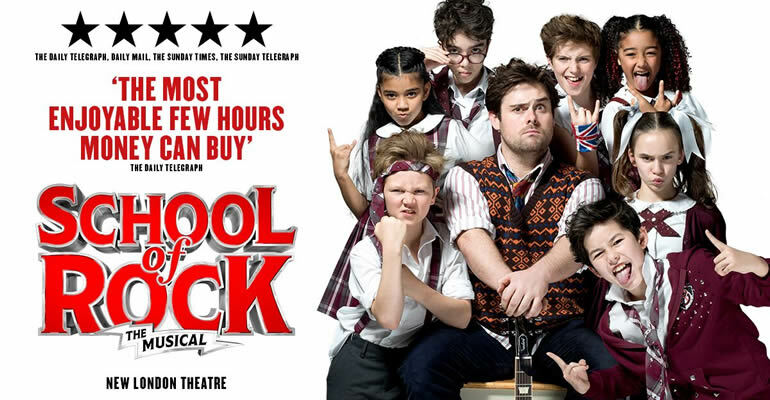 "The most exuberant show in years"
After a successful opening on Broadway in 2016, Andrew Lloyd Webber’s Olivier Award-winning musical School of Rock the Musical plays to packed houses at the Gillian Lynne Theatre. Based on the hit 2003 film starring Jack Black, School of Rock is the hilarious story of wannabe rock star Dewey Finn as he works as an unqualified supply teacher at Horace Green School. Discovering that he is surrounded by musically talented children, he decides to form his own band – the School of Rock. Featuring revamped songs from the original film such as "Teacher’s Pet", the musical boasts a barrage of smash-hit rock-inspired songs with music by Lloyd Webber and lyrics by Glenn Slater, such as "Stick it to the Man" and "You’re in the Band". With a book by Downton Abbey’s Julian Fellowes and direction by Laurence Connor, this is a musical reminiscent of the fun and vigour of Matilda, showcasing some extremely talented youngsters. Don't miss out! This show is recommended 8+. It contains strong language, smoke effects and strobe lights. Please note each person in the theatre must have their own ticket. Under 4's will not be admitted into the venue. Oozing - Simply Brilliance, its a bit odd to say those young kids can really rock it out and are brilliant - its a reminder that our children are indeed just people like all of and no matter how young or how old we are - we are all talented and stars in our own right - but these guys really rock - well worth the cold which only made the show light my fire even more. Very much enjoyed the Joe Jackson concert this eve! Good music and a lovely venue with helpful and friendly staff on hand! Well Done!